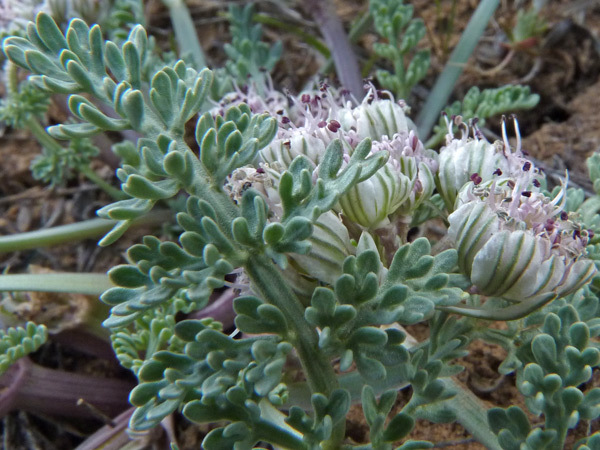 As the photographs below indicate, Vesper bulbosus and Vesper constancei are quite similar in habitat and morphology. But the photographs below also show the distinctive characteristics that a careful hand lens examination of the two species will reveal. 1) The narrower flower bractlets of V. constancei almost always have three prominent veins; V. bulbosus bractlets have one vein. 2) The bractlets of V. constancei are connate (joined) for about 1/3 of their length; the bractlets of V. bulbosus are connate for about 2/3 of their length. 3) The sage-green leaves of both species are divided into numerous tiny leaflets that cup inward, but the leaflets of V. constancei are commonly lobed or divided again and the leaflets are rounded at their apex. The leaflets of V. bulbosus are usually entire and somewhat pointed at their apex. 4) The fruits of V. constancei have broader wings and the fruits are in a tighter cluster. 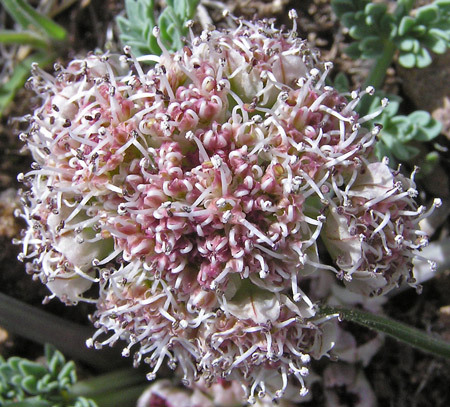 V. bulbosus tends to grow at slightly lower altitudes than V. constancei (4,000' to 6,600' versus 5,000' to 7,200'), but at about 5-6,500 feet it is common to find the two species near each other -- and near other similar looking Cymopterus species such as C. purpureus and C. glomeratus. Constantine Rafinesque (1783-1840) named the Cymopterus genus, probably in 1833 when he renamed Selinum acaule (a name given by Pursh in 1814) to Cymopterus acaulis. The Greek "cym" and "pterum" come together as "Cymopterus", "waved" "wing", referring to the wings of the fruit. 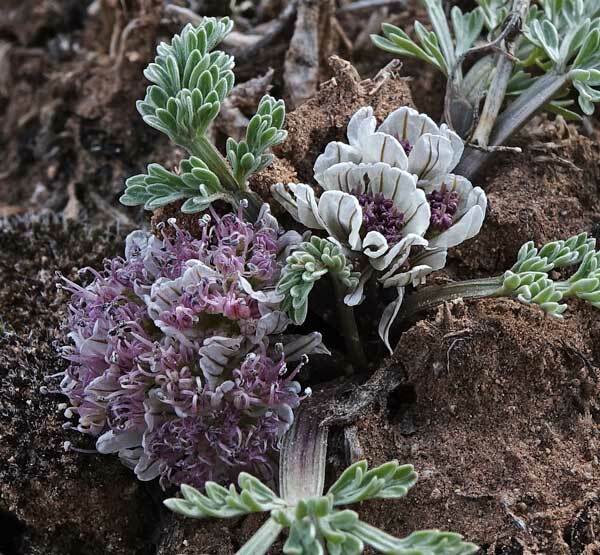 is distinct in its combination of thick taproots, acaulescent habit but consistent production of pseudoscapes, compact inflorescences, white to cream, pink, or purple petals, dorsally compressed mericarps with 4–5, thin, broad dorsal and lateral wings and with 3–9 oil tubes per interval, and particularly by its involucel bracts basally connate, prominently nerved, and totally white to purplish-scarious or with broad white-scarious margins. Guy Nesom indicated to me that the characteristics in bold are especially important for distinguishing Vesper from Cymopterus. The new name of the genus is from Latin, vesper, evening or west, sometimes referring to the "evening star" (usually Venus) seen at sunset in the western sky. The name alludes to the team of Sun and Downie, who have provided molecular analyses (Feng-Jie Sun and Stephen R. Downie 2004, 2010; and including Downie et al. 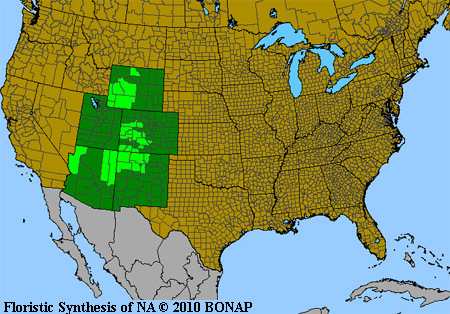 2002) indicating that evolutionary relationships among many of the currently and historically recognized genera of western North American Apioideae are complex, apparently reticulate. As noted immediately above, the team that provided the molecular analyses showing the distinctive characteristics of this new genus was Sun and Downie which Nesom and Hartman conflated to sundown, sunset, evening, vesper. Cute. 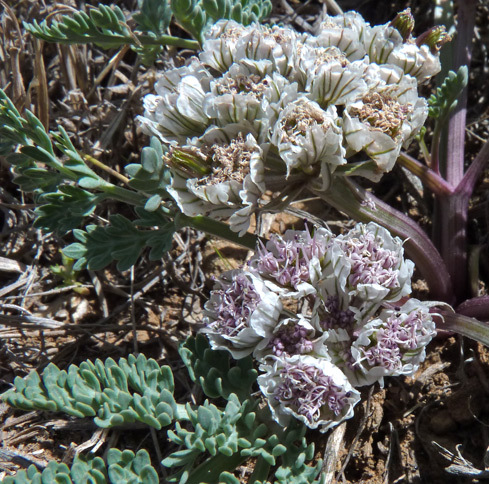 Intermountain Flora observes that "the taxonomic definition of Cymopterus is a vexed question.... 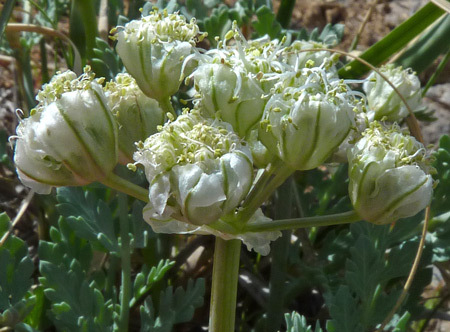 Even the distinction between Cymopterus and Lomatium is subject to failure. Ordinarily one or more of the dorsal ribs [of the seeds have wings in] Cymopterus, but not in Lomatium. Cymopterus newberryi completely bridges the difference. In this species the dorsal wings vary from nearly or fully as large as the lateral ones to poorly developed or even obsolete". McElmo Canyon, Canyons of the Ancients National Monument, March 27, 2005. In early spring, the white papery bracts of Vesper bulbosus are eye-arresting. Purple/pink flowers push through the bracts and enlarge, the bracts folding back and becoming less prominent. 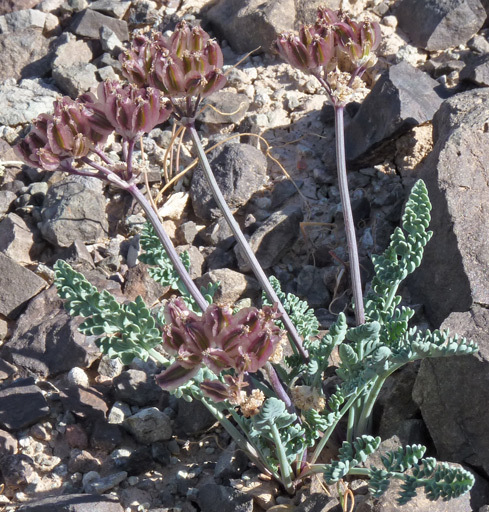 Leaves are a beautiful pale green on broad flat stalks and provide a tasty treat for small critters -- notice the clipped stalks to the left of center. 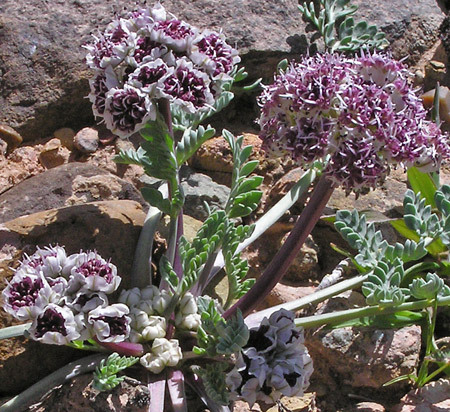 Alice Eastwood first collected specimens of this plant in Durango, Colorado in 1890 and Marcus Jones named the plant Cymopterus utahensis variety eastwoodae in 1895. Aven Nelsen renamed this species Cymopterus bulbosus in 1899. 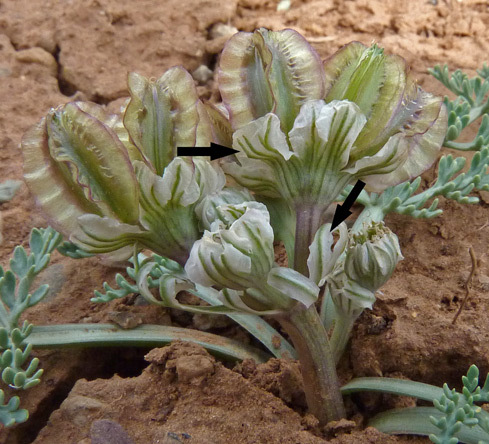 In 2012 Ron Hartman and Guy Nesom separated this species, the one described below, and several others from the Cymopterus genus and placed them in the Vesper genus. 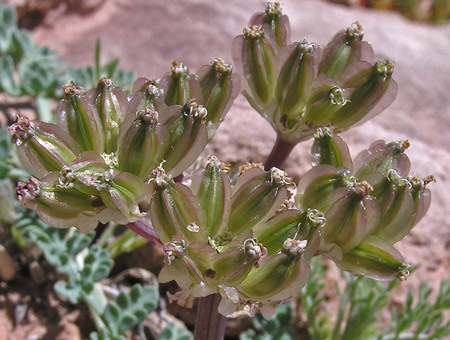 "Bulbosus" refers to the enlarged root. Canyons of the Ancients National Monument, March 27, 2005, April 2, 2005, March 24, 2009, March 13, 2015, Lone Mesa State Park, May 14, 2009, Utah Four Corners area, April 17, 2010, and BLM lands near the San Juan River, April 6, 2005. 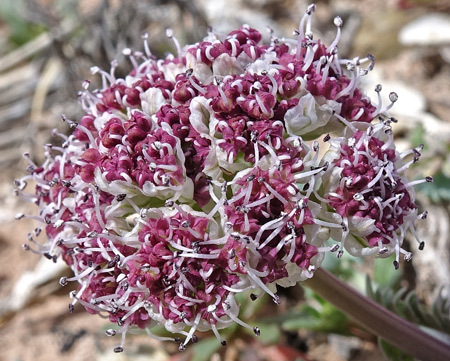 Flowers start completely enclosed in tight papery white bracts (actually "bractlets", since the bracts are those structures that enclose the entire flower cluster) and gradually enlarge; bracts and bractlets remain as the flowers and seeds mature. Albino plants, shown at left below, are rare. 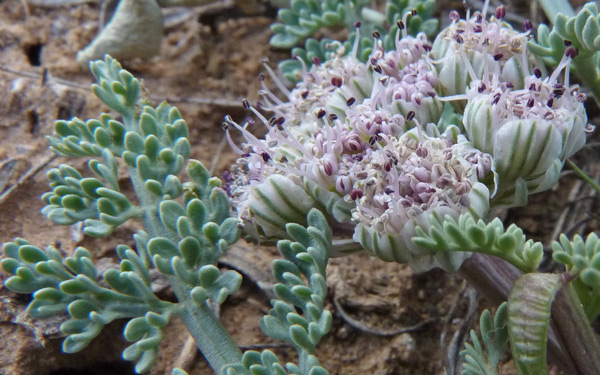 In the photograph of the flower cluster from the underside, you can see the star-shaped bracts (the involucre), the rays that support the individual flower clusters, the white bractlets (the involucels), and the single green-to-purple vein on each bractlet. 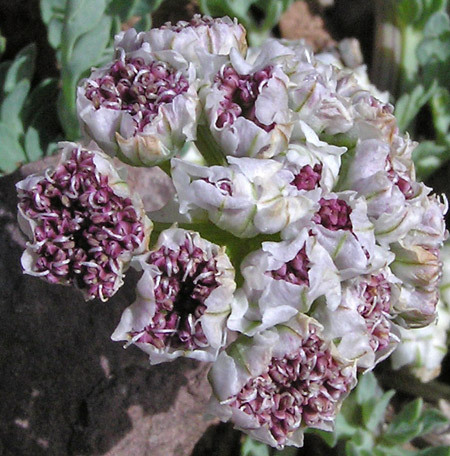 The shape and size of the involucre and involucel and the number of veins are key in distinguishing Vesper bulbosus from Vesper constancei (below) and other similar species. Lower Cross Canyon, Utah, April 11, 2017. Both Vesper constancei and Vesper bulbosus often continue to flower for quite a few weeks and, as the photograph at left shows, you can find all levels of development on the same plant. 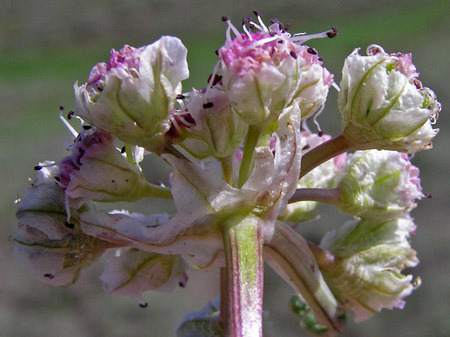 In the lower center of the plant new flowers are emerging from the white bracts, just above them at the 10 o'clock position flowers are more fully developed, and the tallest stems show four other levels of maturity. Yucca House National Monument (near the Sleeping Ute Mountain), February 27, 2017. 1) Vesper constancei's narrower bractlets (bottom photograph on the page, right arrow) are connate (joined) for only about 1/3 of their length and the bractlets have three parallel and equal veins (bottom photograph, left arrow). Vesper bulbosus' bractlets are connate for 1/2 to 2/3 of their length and they have one main vein (see above photographs). 2) The fruits of V. constancei have broader wings and the fruits are in a tighter cluster. 3) Leaflets of Vesper constancei are more finely and repeatedly notched. 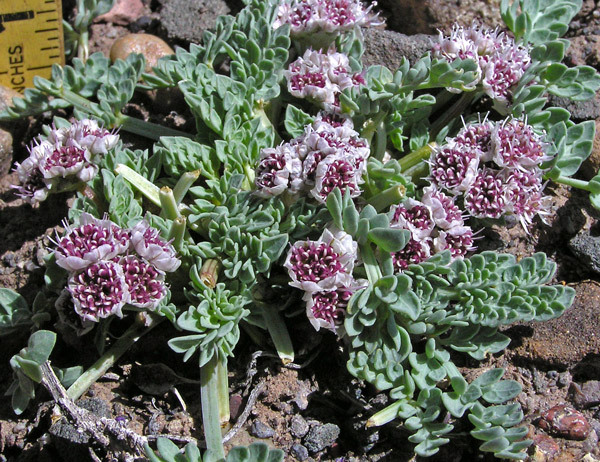 Vesper constancei and V. bulbosus can sometimes be found growing in similar habitats and soils but in the Four Corners region V. constancei tends to grow at slightly higher altitudes (6,000 to 7,000 feet) in sandy soils and flower later; V. bulbosus tends to grow at slightly lower elevations and in heavy clays and flower earlier. However, as always, plants are full of surprises. The third photograph at left shows Vesper constancei growing at 5,940 feet and flowering in February! 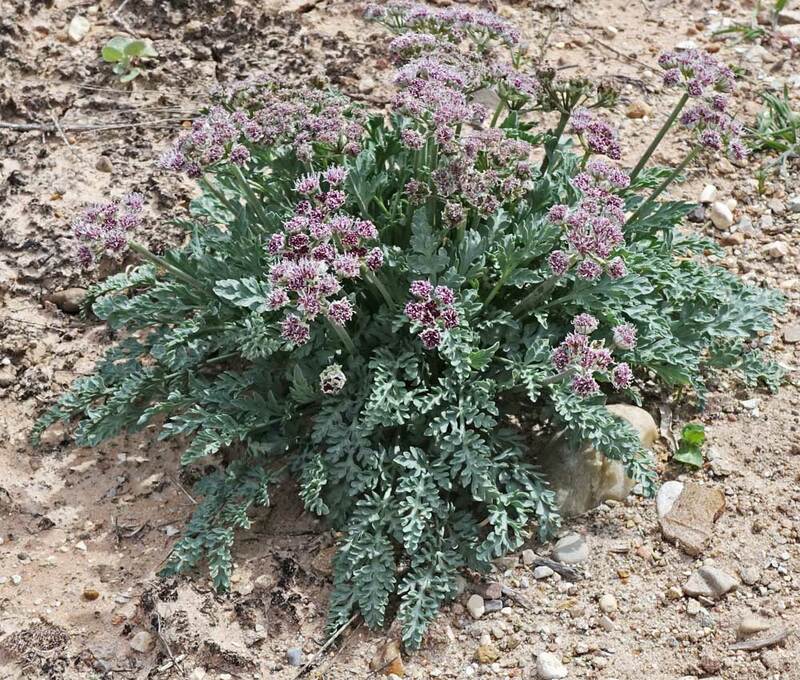 Vesper constancei has often been misclassified as Cymopterus purpurascens in the Four Corners area. 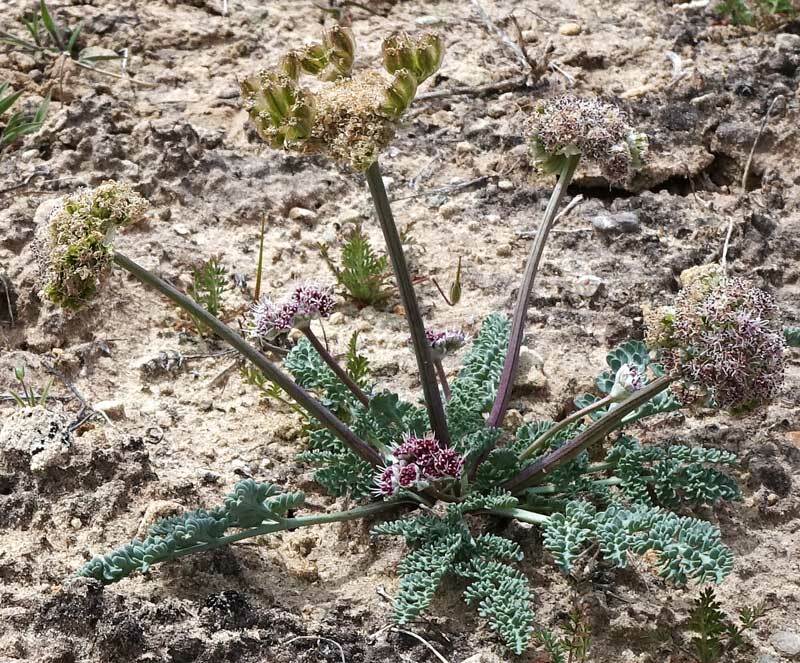 Cymopterus constancei [now Vesper constancei] is named in honor of Lincoln Constance of the University of California at Berkeley, for his stellar contribution to the systematics of Apiaceae and for the generous help and advice given me on western North American umbels. (Click for more biographical information about Constance). Carpenter Trail, Cortez, April 12, 2013, lower Cross Canyon, April 27, 2013, & Mike and Mona's Five Springs Farm, May 8, 2010.
the arrangement and size of the seed heads and seeds.